At face value, the last payrolls reading of 103k looked very disappointing. But there are a few reasons why we were slightly less convinced. Firstly, for whatever reason, the March jobs numbers tend to come in on the low side. We also think that the trend seen in February’s report – soaring employment (326k payrolls) combined with a rapid influx into the jobs market – looked a bit too good to be true. A growing range of surveys suggests firms are finding it harder and harder to find staff. This is neatly depicted by the Dice-DFH measure of vacancy duration, which shows it’s taking companies twice as long to fill posts as it did during the depths of the crisis. And according to the NFIB survey of small businesses, quality of labour has overtaken tax and regulation to become the single biggest problem cited by small firms – the first time on record that this has been the case. In the same survey, 35% of small businesses say they have at least one position they can’t fill at all, the highest proportion since 2000. The upshot is that a slower rate of jobs growth should not be wholly unexpected. Admittedly this month we could see a rebound to the 200k area after the March drop. But with the economy essentially at full employment, even another weaker payrolls number is unlikely to have the effect on Fed policy it once might. With firms finding it hard to find the right staff, they are inevitably having to pay more to attract talent. This is particularly true of corporates outside of the big cities, where the pool of workers with specific skills is often smaller. This week, we expect average hourly earnings (AHE) growth to stick at 2.7%. But looking at a broader range of data, we are seeing increasing signs that these skill shortages are feeding through. Take the median wage growth calculations by the Atlanta Fed. One reason for looking at these over the AHE numbers is that research has found they do a better job of adjusting for movements in and out of the jobs market, for instance, the greater number of higher-paid retirees leaving work (from the ‘baby boom’ generation) and a higher number of low-skilled people entering. Both factors are believed to have pushed down the average level of pay. These median pay calculations suggest those workers who have changed jobs in the past 12 months are being paid 4.4% more than a year ago, which is not far off the pre-crisis peak of 4.8%. 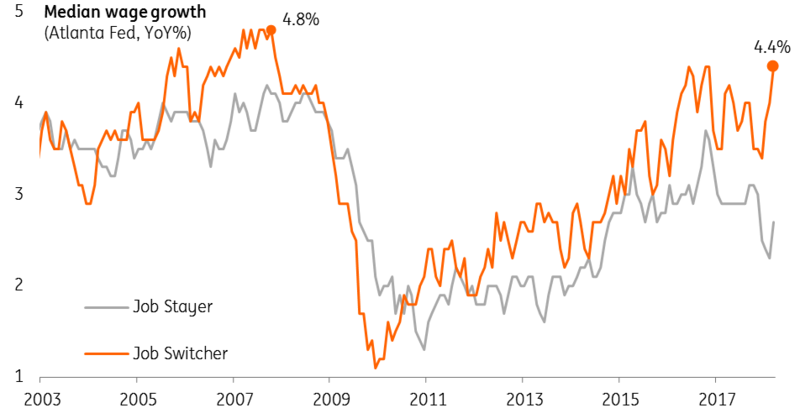 As these pay pressures continue to ripple through the jobs market overall, we wouldn't be surprised to see the headline rate of wage growth testing 3% again this year. This is a key reason why we expect three further hikes from the Fed this year. As we alluded to above, we saw over 1.3 million people enter the labour market in January and February. Nearly all of these workers found employment almost immediately, which meant that the level of unemployment remained unusually flat. This doesn't really tally with the skill shortage story, and we suspect some correction is due in the household survey this week. We saw a bit of a readjustment in March, and a further fall in unemployment in April is likely to have dragged the overall rate down to 4.0% - another post-crisis low.